Friday night I joined Tim and Vickie DeTal for prayers. We prayed together for two hours. Tim played soft instrumental music in the background while we prayed and sought the Lord. Vickie brought some devotional literature and began to read it aloud. On one piece she read "digging the old wells." At that point I saw a vision. . . When Lois myself and the family came here in 1976 there were wells everywhere. Some of the wells were "Dug wells," organized and lined carefully with brick. Other wells were spontaneous wells, Artesian Wells that flowed freely with cold refreshing water. Dug wells last about as long as their founder. A well's productivity may be thirty to forty years. 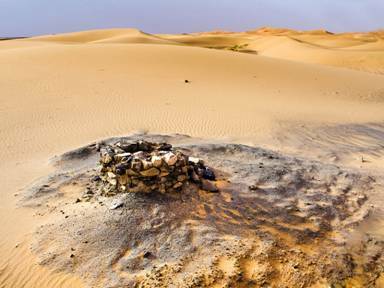 When the founder, discoverer and digger retires or dies, the well too often becomes clogged and dries up. Please understand, I speak in mysteries and allegories. To be specific in 1976 when I arrived in this region, there were 52 churches and ministries in this valley. There were 250 clergy persons serving these churches. 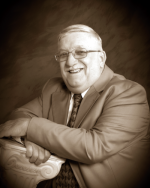 The refreshing water of the Holy Spirit flowed freely in the Shenango Valley region. There was a well in New Wilmington, Living Word. There was a well flowing at Pleasant Valley Evangelical Church in Niles, Ohio. I knew the men that dug these spiritual wells. I also found wells of refreshing in the Jesus' Events held at Agape Farm and also in Mercer under the supervision of Pastor Jim Erb. In the late 70's we were refreshed by the annual week-long conferences at Duquesne University. The wells of refreshing were many and flowing. The Duquesne Weekend Revival occurred on the university campus at a 3 day weekend retreat in mid-February 1967. More than 120 to 180 million Catholics have been affected by the impact of Duquesne and the Charismatic Movement. Buckets, Bottles and Pitchers in ancient Israel were made of sheepskin or goatskins. 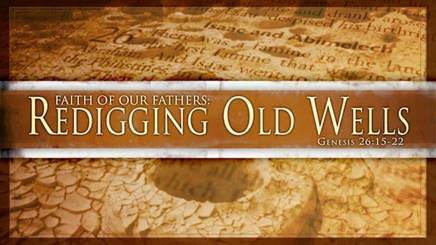 In today's text Isaac inherited his father Abraham's flocks and headaches w/ancient foes, the Philistines. What does it take to reopen the wells of our forefathers? The Philistines plugged the wells with rocks, old wood, dead carcasses and garbage to ruin the well for future use when Abraham died. Isaac and his men had to remove all the garbage to make the well fresh once again. 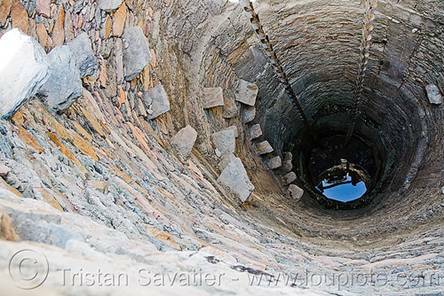 Once the well was cleared the water would start flowing again, the well would once again become clean and be useful for drinking and watering the flocks and the land. Each Generation Must. . .
D. What plugs your well today? whoever believes in Him should not perish but have everlasting life. 3 Therefore with joy you will draw water From the wells of salvation. 2. World, Flesh and Devil say you'll suffer "Lack"
will seek Me and find Me, when you search for Me with all your heart. will wipe away every tear from their eyes."